Purchaser, following is a true story how the Voice Alert was used. At the end of the story, you will find a bonus offer just for you. When Dr. Ron Caro's wife wanted to leave their apartment after their new mountain bikes were stolen from their balcony facing the alley, Dr. Caro installed a security system that has caught and prosecuted more than 14 perpetrators in the past two years. Dr.Caro lives in an upscale neighborhood in Whittier, California, in an apartment directly above the complex's carports adjacent to the alley. Two year's ago, after his bikes were stolen, Dr. Caro purchased four bullet cameras, a time-lapse video recorder, and a quad to monitor the activity in and around the carports, alley, and patio. The week after installing the system, a neighbor had a break-in, so Dr. Caro reviewed the tape to see what happened. He found the incident and gave the tape to the police. "The police took a report and told me that unless I knew where the suspect lived or who he was there was really no way to catch the guy," Dr. Caro explained. So Dr. Caro added Voice Alert, a wireless notification device, to his system. The Voice Alert system combines wireless infrared sensors with a speaker/receiver that allows the user to record up to six individual messages. When a sensor is triggered by activity, a signal is sent to the receiver/speaker and it plays the corresponding message to alert the home or business owner that an incident has occurred. Dr. Caro installed three Voice Alert sensors in the carport and positioned them so that the infrared beams intersected to detect anything that entered the carport. Less than a week after he installed Voice Alert, the receiver speaker sounded at 4 a.m. playing the message "Someone's in the carport!" and waking Dr. Caro. He turned on his monitor and saw the same guy who robbed his neighbor a week earlier in his carport. The time-lapse recorder was recording and Caro, a former Marine Corps Officer, held the suspect until police arrived. Dr. Caro gave the time-lapse recording to the police, providing enough evidence to prosecute the suspect. That same scenario, with different suspects, has occurred numerous times over the past two years. Each with the same outcome, the suspect gets caught and prosecuted. "One police officer even mentioned that more people should have a system like mine," said Dr. Caro. "As far as I'm concerned, surveillance without sensors is not effective. You need to catch them in the act." 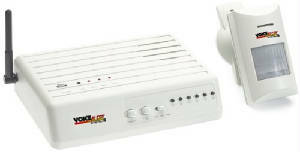 Dr. Caro looked at other notification systems and found Voice Alert to have the best wireless range and the best price. "It's a great piece of equipment," said Dr. Caro. P.S. Collin, you can get more information on the Voice Alert and order here. P.P.S. If you order within the next five days, I will give you a FREE Extra Sensor...a $69.95 value. Just mention FREE Extra Sensor in the comments box when you check out. Don't forget...if you don't mention FREE Sensor we won't know to send it to you.